The perfect tool for treating ingrown toenails. 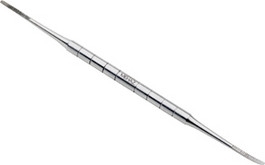 Fine ends, one straight and one curved, gently lift and file edges without irritating sensitive skin. Stainless steel.